Why to buy etiquette the gun for marking. Its main application, of course, price tags. With the help the etiquette gun on a self-adhesive label is printed by the prices (price tags), weight, the name, the article of goods, etc. Modern guns use etiquette for marking of food, clothes, products from plastic, a tree and threw. The invention of the cash register belongs to James Ritti from the city Dighton (State of Ohio). In 1871 he decided to become a restaurateur and opened a small saloon in Dighton. The institution quickly became popular, but instead of profit constantly yielded to the owner only losses. Administrative qualities of James were at anything here, the problem was covered in continuous theft and concealment of part of revenue by cashiers. Dismissal of these people did not help, came to their place new which could not keep too from an opportunity to steal. Incessant turnover of staff practically ruined James Ritti to distract from problems, he went to cruise across Europe. By the ship James became interested in the mighty cars setting the vessel in motion and made friends with the chief mechanical engineer. During excursion on an engine room of the ship he with a great interest looked at an automatic tachometer of a rowing shaft, and suddenly the idea came to its mind: "And why not to apply this principle to calculation of money?". This idea so captured James Ritti that he decided to reduce the travel across Europe and came back home. James told the idea to the brother John, and together they made the unpretentious car for calculation of money. On it there were two rows of keys, each of which meant a certain sum, and the hour dial with two shooters: one for dollars, and the second for cents. Ritti's brothers improved the second model of the cash register, they replaced dials with the disks which became classical. On this design on November 4, 1879 brothers took out the patent No. 221360. The third model of the device called "The incorruptible cashier Ritti" (Ritty's Incorruptible Cashier) was already able to show to the buyer the purchase sum, and the fourth punched a result small holes on a paper tape. 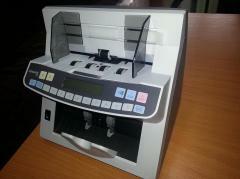 It also became the first production model of the cash register. But, despite success of the invention, by 1881 James Ritti understood that it is not interesting to it, and returned to the small institution. He sold the patent for the cash register to Jacob Ekkert who in 1884 gave the company to John Patterson, one of the first buyers of devices. Patterson renamed firm into National Cash Register Company subsequently. 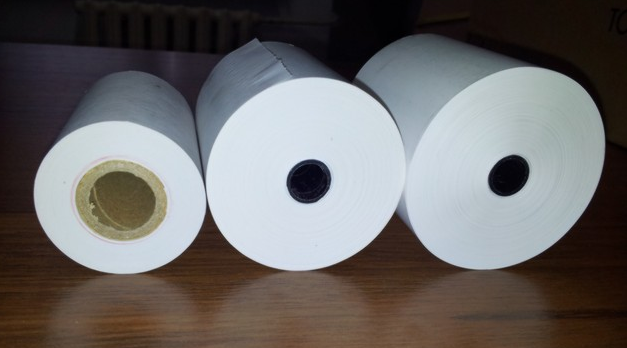 Unbelievable price on Check tape for bank terminals in Almaty (Kazakhstan) company A Tehcentr Plyus, IP.